WHEN SHOULD I SCHEUDLE MY CHILD’S FIRST VISIT TO THE DENTIST? We recommend that your child visit the dentist when they have their first tooth. 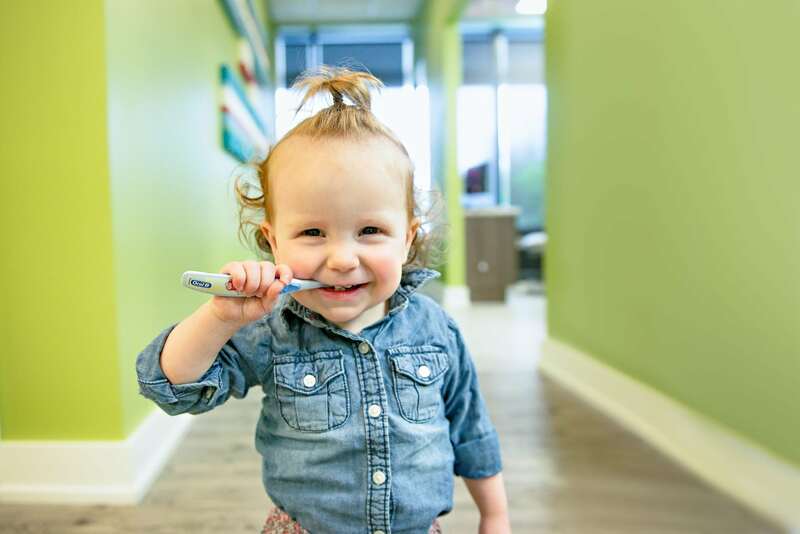 The American Academy of Pediatric Dentistry and The American Academy of Pediatrics recommend that children be seen within six months of having their first tooth or by their first birthday. Your child’s first visit to the dentist is usually short and simple. Dr Katie will check your child’s teeth for placement and health. She will also look for any potential problems with the soft tissue and jaw. Our staff is very comfortable cleaning your child’s teeth on the first visit if you would prefer. We are also happy to place a Fluoride treatment for your child. We will discuss how to care for your child’s teeth and discuss tips and tricks. HOW CAN I PREPARE MY CHILD FOR THEIR FIRST DENTAL VISIT? Your child’s first visit to the dentist should be a fun experience. The best preparation is to maintain a positive attitude before the visit. Children pick up on adults’ fears and apprehensions so do not make negative comments about trips to the dentist. Children should not expect the visit to be a negative experience. Show your child pictures of the staff and the office on the website and talk about how fun and exciting the experience will be. Please remember that Dr Katie and our staff are trained to handle fears and anxiety and our staff excels at putting your child at ease during their visit. We generally recommend that your child visit the dentist every six months. Based on individual circumstances, we may recommend more frequent visits.